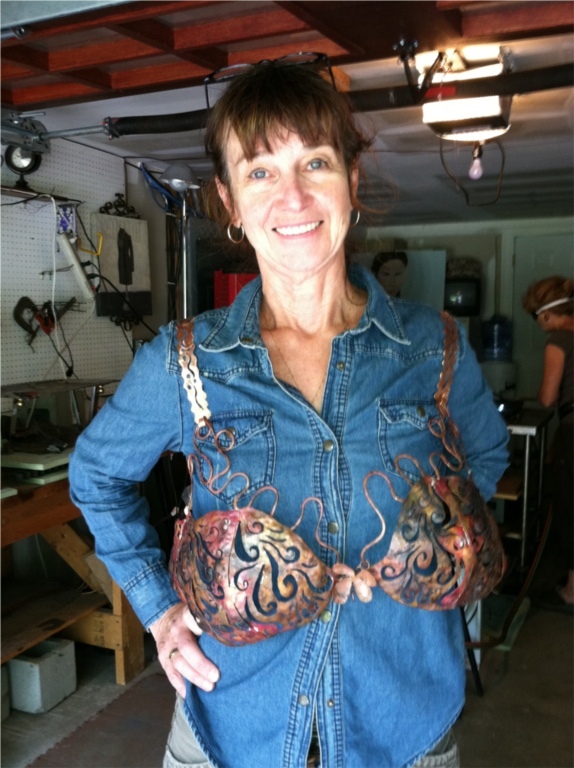 The inspiration for this wearable ArtBra came from a long time friend and cancer survivor. She asked me if I’d like to make a sculpture for the auction and I immediately knew what I wanted to create. I was honored to be asked to participate in an event that means so much to so many people. The world is a better place because my friend is here, giving so much herself, making a contribution to the quality of other’s lives. The ArtBra is made of copper and is meant to be worn in the fashion show. It symbolizes the protection we need from breast cancer. It is strong and flexible, just like all of us trying to overcome the hurdles that finding a cure places before us.